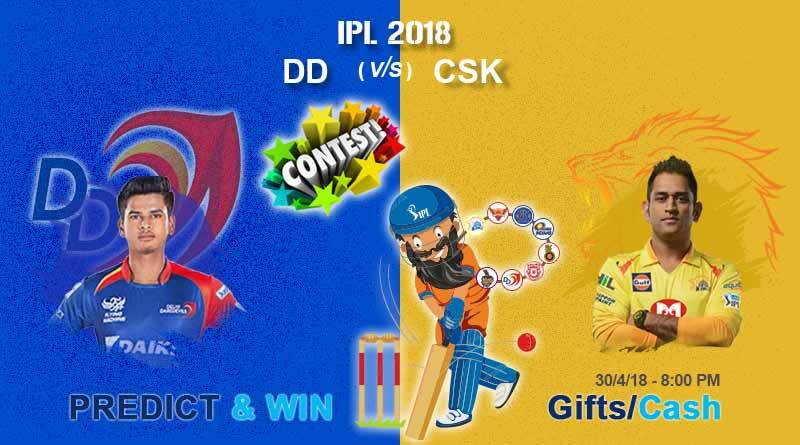 Match 30: IPL 2018: DD Vs CSK – Can Delhi continue their resurgence? DD Vs CSK Match Prediction – ICE Dhongi Baaba is still calculating who will win the match today. Wait for some more time to know his thoughts. Delhi Daredevils and Chennai Superkings’ fortunes couldn’t be much more opposite than two sides of a coin this season. In the DD vs CSK, while comeback side Chennai sit 2nd in the table, Delhi are slumped right down at the bottom ever since week one. DD did manage to see light at the end of the tunnel in their last match though after they notched up one of the biggest total this season to trash KKR at home. For CSK their last match was a shock defeat against strugglers MI. With the IPL so unpredictable this year, form is no guarantee of a win. And the Chennai side will be well aware of this. Veteran MS Dhoni will be fully aware that on their day Delhi have enough firepower in their arsenal to defeat them. This paired with Delhi’s last performance will make Dhoni’s side extra cautions when they host Delhi in their home today. The saga with Gambhir and the negativity surrounding it was put behind the Daredevils who put on the best batting display of their season at the Feroz Shah Kotla last time when they stepped out onto the pitch. Anyone who follows the IPL knows that Delhi are the most unpredictable side though. They can be extremely good one day and equally poor the next day. So which Delhi will turn up when they travel once again to play their eight-match of the tournament. We as fans of the game hope the same one as the last side. If not we could be witnessing a petty one-sided match with Chennai sweeping up a comfortable win. We at Tentaran up the odds and predict Delhi to make it back to back wins. Delhi Daredevils: Shreyas Iyer (C), Rishabh Pant, Glenn Maxwell, Gautam Gambhir, Jason Roy, Colin Munro, Mohammed Shami, Amit Mishra, Prithvi Shaw, Rahul Tewatia, Vijay Shankar, Harshal Patel, Avesh Khan, Shahbaz Nadeem, Daniel Christian, Jayant Yadav, Gurkeerat Singh Mann, Trent Boult, Manjot Kalra, Abhishek Sharma, Sandeep Lamichhane, Naman Ojha, Sayan Ghosh, Liam Plunkett, Junior Dala. Stay tuned for all the interesting moments and match highlights of DD vs CSK match.